What conditions or complications can be associated with PCOS? What treatments are available for PCOS? 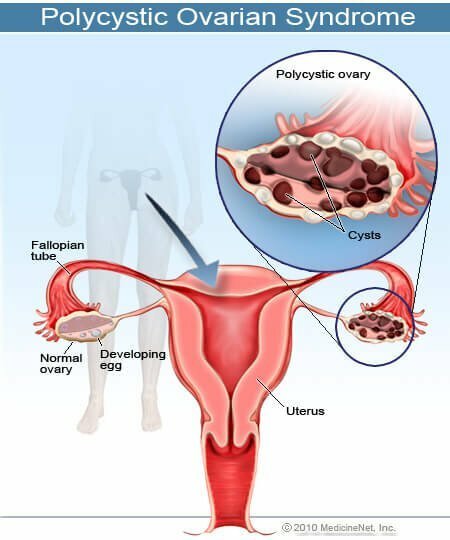 Polycystic ovarian syndrome (PCOS) is an illness characterized by irregular or no periods, acne, obesity, and excess hair growth. Women with PCOS are at a higher risk for obesity, diabetes, high blood pressure, and heart disease. PCOS's main signs and symptoms are related to menstrual disturbances and elevated levels of male hormones (androgens). With proper treatment, risks can be minimized. Ideal treatment is directed to each of the manifestations of PCOS. PCOS occurs in 5% to 10% of women and is the most common cause of infertility in women. PCOS symptoms may begin in adolescence with menstrual irregularities , or a woman may not know she has PCOS until later in life when symptoms and/or infertility occur. Women of all ethnicities may be affected. Symptoms related to elevated androgen levels include acne, excess hair growth on the body (hirsutism), and male-pattern hair loss. multiple small cysts in the ovaries. Another hormonal abnormality in women with PCOS is the excessive production of luteinizing hormone (LH), which is produced by the pituitary gland, which is involved in stimulating the ovaries to produce hormones. Other possible contributing factors in the development of PCOS may include a low level of chronic inflammation in the body and fetal exposure to male hormones. Women with PCOS are at a higher risk for a number of illnesses, including high blood pressure, diabetes, heart disease , and cancer of the uterus(endometrial cancer). Because of the menstrual and hormonal irregularities, infertility is common in women with PCOS. Because of the lack of ovulation, progesterone secretion in women with PCOS is diminished, leading to long-term unopposed estrogen stimulation of the uterine lining. This situation can lead to abnormal periods, breakthrough bleeding, or prolonged uterine bleeding. Unopposed estrogen stimulation of the uterus is also a risk factor for the development of endometrial hyperplasia and cancer of the endometrium (uterine lining). However, medications can be given to induce regular periods and reduce the estrogenic stimulation of the endometrium (see below). Changes in skin pigmentation can also occur with PCOS. Acanthosis nigricans refers to the presence of velvety, brown to black pigmentation often seen on the neck, under the arms, or in the groin. This condition is associated with obesity and insulin resistance and occurs in some women with PCOS. Obesity that occurs with PCOS needs to be treated because it can cause numerous additional medical problems. The management of obesity in PCOS is similar to the management of obesity in general. Weight loss can help reduce or prevent many of the complications associated with PCOS, including type 2 diabetes and heart disease. Consultation with a dietician on a frequent basis is helpful until just the right individualized program is established for each woman. Finally, a surgical procedure known as ovarian drilling can help induce ovulation in some women who have not responded to other treatments for PCOS. In this procedure a small portion of ovarian tissue is destroyed by an electric current delivered through a needle inserted into the ovary. This is an older procedure which is only rarely utilized. American Association of Clinical Endocrinologists Polycystic Ovary Syndrome Writing Committee; American Association of Clinical Endocrinologists Position Statement on Metabolic and Cardiovascular Consequences of Polycystic Ovary Syndrome. Endocr Pract. 2005 Mar-Apr;11(2):126-34. No abstract available. Azziz R; Sanchez LA; Knochenhauer ES; Moran C; Lazenby J; Stephens KC; Taylor K; Boots LR. Androgen excess in women: experience with over 1000 consecutive patients. J Clin Endocrinol Metab 2004 Feb;89(2):453-62. Schroeder BM; American College of Obstetricians and Gynecologists. ACOG releases guidelines on diagnosis and management of polycystic ovary syndrome. Am Fam Physician. 2003 Apr 1;67(7):1619-20, 1622. No abstract available.